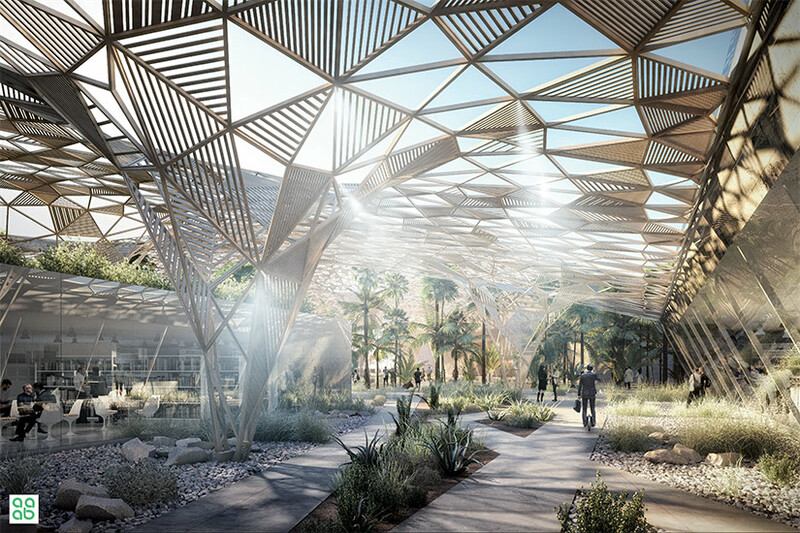 The competition, launched by the Phosboucra Foundation to select of the architectural firm which will design the University of Foum El Oued Technopole, was won by architects Antoine Bechu and Fouad Bennouna. The architectural design approach is based on the potential and existing assets of the natural site, using the climate, winds, sand, and know-how of the sub-Saharan coast, to achieve the greatest sustainable performances, and to offer future students and professors an environment open to research on water, energy and biosaline agriculture. The design of the project aims to forge with, and integrate, the natural setting by optimizing the dialogue between the building and its environment. Vegetated tents, half-tents/half-dunes, under which flow buildings, woven in the landscape. Following the lines of the desert dunes, the inner street is its crossroads symbolize the cracked lands of the Oued. Covered by a canopy, they leave an important place for nature and create a gathering place for people.